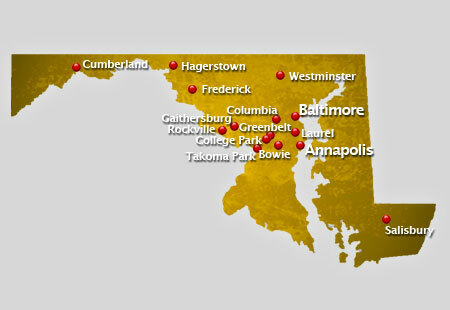 AirSign provides extensive aerial advertising coverage throughout all areas of Maryland. From beach aerial advertising to sporting events and over busy highways, we'll display your message to crowds in a way your audience will be certain to remember. Famous for its attractions, Maryland is home to many tourist attractions. The state of Maryland is the site of the U.S. Naval Academy, a training ground for aspiring men and women for officers in the U.S. navy and marine corps. Other popular attractions are the Fort McHenry National Monument in Baltimore, Harpers Ferry and Chesapeake and Ohio Canal National Historic Parks and the Antietam National Battlefield. History tells that Fort McHenry was attacked by a British fleet but was resisted by Major George Armistead. Such defense was the inspiration of Francis Scott Key to write the National Anthem, The Star-Spangled Banner. Maryland, geographically, is dubbed as America in Miniature simply because of its variety of topographical features. It has low marshlands with great wildlife, sandy dunes, hills of forest trees and fauna and mountains with pine groves. It is bordered by the states of Pennsylvania in the north, Delaware in the east, West Virginia and Virginia in the south and West Virginia in the west. Climate in the state depends on the area of topography. Generally, it has a humid subtropical climate with hot and humid summers and mild cool winters. The largest university in the state of Maryland is the University of Maryland, College Park. It is also the first university in the state, founded by the Maryland Agricultural College in 1856. Most of the public universities are under the University System of Maryland. However, selected institutions such as Morgan State University and the U.S. Naval Academy are not affiliated with the University System of Maryland. In sports, numerous major and minor sports league teams dwell in Maryland. Some of these worldly known sports league teams are the Baltimore Ravens and Washington Redskins of the National Football League, Washington Capitals of the National Hockey League, the Baltimore Orioles and the Washington Nationals of the Major League Baseball and the Washington Wizards of the National Basketball Association. Crowds are an aerial advertiser's paradise! A typical flight over popular events or locations can result in as many as 8,000,000 impressions! Have us fly your aerial banner over the crowds in Maryland to put your message wherever you want, whenever you wish at the best value in mass marketing!